Insect Pests of Millets: Systematics, Bionomics, and Management focuses on protecting the cultivated cereals that many worldwide populations depend on for food across the semi-arid tropics of the world. 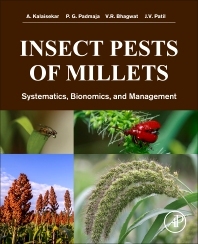 Providing coverage of all the major cultivated millets, including sorghum, pearlmillet, finger millet, barnyard millet, prosomillet, little millet, kodomillet, and foxtail millet, this comprehensive book on insect pests is the first of its kind that explores systematics, bionomics, distribution, damage, host range, biology, monitoring techniques, and management options, all accompanied by useful illustrations and color plates. By exploring the novel aspects of Insect-plant relationships, including host signaling orientation, host specialization, pest – host evolutionary relationship, and biogeography of insects and host plants, the book presents the latest ecologically sound and innovative techniques in insect pest management from a general overview of pest management to new biotechnological interventions. Dr. A. Kalaisekar, Senior Scientist in Agricultural Entomology at the ICAR- Indian Institute of Millets Research (formerly Directorate of Sorghum Research), Hyderabad, India. He graduated with a bachelor’s degree in Agricultural sciences and completed his master’s in Agricultural Entomology from Acharya N. G. Ranga Agricultural University, Hyderabad, India. He finished his Ph.D. in Agricultural Entomology (Insect Taxonomy) at the Agricultural Research Institute, New Delhi, India. He joined ICAR-Indian Institute of Millets Research as a Scientist in 2008 and successfully handled several research projects in systematics and population biology of Shoot flies (Atherigona spp.). Dr PG Padmaja, Principal Scientist in Agricultural Entomology at the ICAR- Indian Institute of Millets Research (formerly Directorate of Sorghum Research), Hyderabad, India. She graduated with a bachelor’s degree in Agricultural Sciences and completed her master’s in Agricultural Entomology from the Andhra Pradesh Agricultural University, Tirupathi, India. She did her Ph.D. in Entomology from the Indian Agricultural Research Institute (IARI), a premier institute of higher studies in agricultural sciences in New Delhi, India. She was awarded Rothamsted International Fellowship and did her post-doc in the Biological Chemistry, Rothamsted Research, Harpenden, UK. She joined ICAR-Indian Institute of Millets Research as a Scientist in 1998 and successfully handled several research projects. She is interested in finding new ways to protect millets from insect pests. Her research focuses on host plant resistance mechanisms, phenotyping for shoot fly resistance and bioassay of Bt transgenic sorghum against stemborer. Presently working on devising strategies for exploiting semiochemicals for pest management in millets at the field level. Her major area of interest is to unravel the host-insect interactions by identification of novel semio-chemicals, tritrophic interactions mediated by induced defense volatiles, stored grain pest management and develop an innovative approach for pest management in millets. She has been awarded with NUFFIC fellowship from Netherlands government for training on IPM and Food safety at Wageningen International Centre, The Netherlands. She has more than 40 scientific publications which include high impact journals such as Journal of Chemical Ecology, Crop Protection, Theoretical and Applied Genetics, Molecular Breeding, Plant Breeding, Euphytica, Phytoparasitica and Journal of Insect Science. She has guided students for their post graduate and doctoral studies. She is also the Fellow of Plant Protection Association of India and life member of Society of Millets Research, Hyderabad, India. Dr. V.R. Bhagwat, Principal Scientist in Agricultural Entomology at the ICAR- Indian Institute of Millets Research (formerly Directorate of Sorghum Research), Hyderabad, India. He graduated with a bachelor’s degree in Economic Entomology completed his masters in Ecology Entomology and his Ph.D. in Entomology from Dr Panjabrao Deshmukh Krishi Vidyapeeth, Akola, India. He received Team ICAR Award for Outstanding Interdisciplinary Team Research in Agriculture and Allied Sciences for the Biennium 2005-06 to Drs SK Tyagi, Mridula Devi and VR Bhagwat for their outstanding research contribution in Engineering and Technology. Dr. Patil joined as the Director, Directorate of Sorghum Research, Hyderabad in 2010. He is also instrumental in creating Centre of Excellence (DAC, Ministry of Agriculture, GOI) which is a state of the art facility for providing advanced training in the field of value added food products. Apart from functioning as Director, he is actively engaged in research with field evaluation of thousands of sorghum germplasm accessions for useful traits. Dr.J.V. Patil has developed 19 varieties of safflower, chickpea, green gram, rajma bean, pigeon pea and sorghum. He has executed several research projects including international collaborative ones such as DFID, ICRISAT-IFAD, Bill & Melinda Gates Foundation - Hope Project and Mc Knight Foundation, USA funded projects. Apart from varietal development he also developed and popularized several crop production technologies such as sowing methods, seed treatment, foliar nutrient application and IPM in chickpea and in situ moisture conservation, soil type-based cultivars, protective irrigation, nutrient supply and intercultural time schedule in sorghum. He is receipient of many reputed awards and recognitions such as ICRISAT’s Doreen Mashler Award 2002, CGIAR’s King Baudouin Chickpea team Award 2002, Baliraja Late Annasaheb Shinde Smruti Krishi Sanshodhan Gaurav Purskar 2004, Vasantrao Naik krishi Puraskar 2005 and Maharashtra State Government’s Agricultural literature Award 2010He has to his credit 107 peer reviewed foreign and national journal papers, 16 books and 53 other technical publications. He delivered 27 Radio Talks and 11 TV shows for the benefit of farmers cultivating sorghum and pulses.